The Young Adult area is located on the upper level between the Adult Fiction and Reference collections. Although the Young Adult area is in a separate location from children’s it still falls under Youth Services. The Young Adult is a unique space for teens 12-18 years old and contains furnishings an stylish computers that reflect the tastes and interests of this age group. 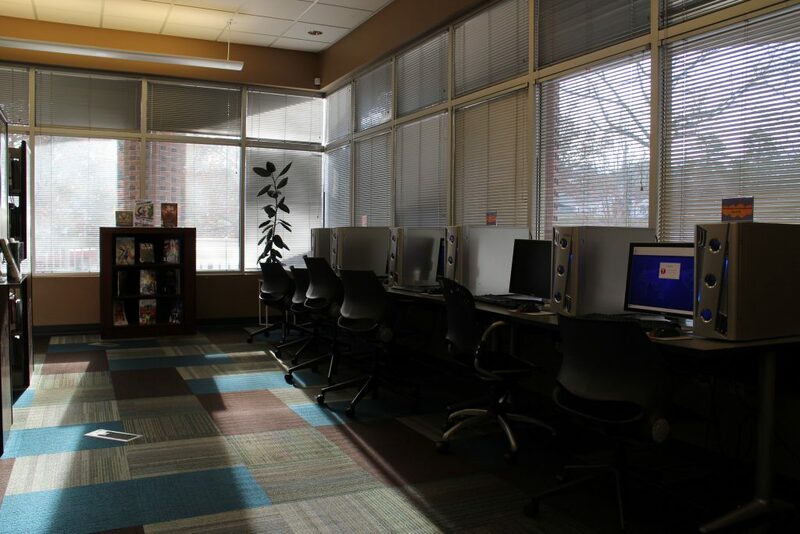 The Young Adult area includes popular age appropriate books, magazines, movies, and six computers with internet access. For more information about programming and what’s available in the young adult area, check out our events calendar. All programs, events, and classes are free and open to the public. The Youth Services Department offers many programs in a seasonal format for all ages: babies to teens. Youth Services staff members are experienced and enthusiastic about offering activities that are meaningful and fun for children of all ages. For a full list of current programs check out our calendar of events. All programs, events, and classes are free and open to the public. Game nights at the library focus on friends and family getting together to interact with game consoles (Wii and PlayStation) and board games. Enjoy games such as Mario Bros., Wii Sports and more. All ages are welcome. Every year, the Summer Reading Program begins on the Saturday after the Rockdale County School System’s last day of school. The program is always quite popular as children and teens read as many books as they can for fun, prizes, and recognition. In addition to reading, there are the exciting “Thrilling Thursdays” performance series, where performing artists entertain and educate through music, dance, magic, puppetry and storytelling. Parents can participate in summer reading too! Adults Services Summer Reading Programming for adults. Visit the Adult Services page for more information. are books that are suitable for teen readers, ages 13-18. Many of the books in this section are a collection of series books or stand alone works. Popular series such as Hunger Games, Divergent, and the selection can be found in this section. are books that are based on real facts, real people, and true events. These books are great for research-based projects, but can be read for entertainment as well. Books found in this section range from healthy living, technological advances and social issues, to cook books, entertainers and authors, and other topics of interest for curious minds. are a growing collection of novels in comic book format. Manga can be found this section along with other popular titles such as Marvel Girl and the illustrated Dr. Who novels. are available in our growing collection in DVD format. The collection includes movie adaptations of popular teen books. are only available in CD format. There are six computers in the Young Adult section. These are only available for teen use and can only be accessed by patrons 12-18 years of age with a valid PINES library card. Every computer in this section is internet accessible and equipped with Microsoft Suite. Personal headphones can be used with these computers or headphones can be requested only at the Youth Services desk. The purpose of the Conyers-Rockdale Library Teen Advisory Board is to encourage middle and high school students (ages 13 to 18) to become involved users of the library through the promotion of reading and participation in the library. The Conyers-Rockdale Library Teen Advisory Board (TAB) is a group of dedicated, involved middle and high school students who are interested in making a difference at their library. TAB members play a critical role in developing the library’s young adult collection, young adult outreach, program planning and marketing, and making the library a friendlier place for young adults. TAB membership is a commitment of time; TAB meetings are once a month for one hour. Members are expected to participate in a TAB quarterly project and will have a direct impact on young adult section of the library. Are you interested in serving on the Teen Advisory Board? Must be willing to commit AT LEAST one hour a quarter (every 3 months) towards meetings. Must be willing to commit one weekend a quarter (every 3 months) working on the designated TAB quarterly project. Attend meetings. After two unexcused absences, membership will be suspended. Attendance during TAB quarterly project MANDATORY. Any discrepancies should be discussed during quarterly project planning. Attend as many Young Adult programs as possible and help with the set up and clean up. Be a responsible library user and a role model at TAB and other library functions.